This tutorial should help you get started with using the basic features in 3D Analyze. Most games will use roughly the same settings in order for it to run, but some games will require specialized settings. This tutorial will not cover that, but if you come across a game such as this you can search the forums for help or experiment with settings yourself to try and get the game to run. 1. Download 3D Analyze 2.36, you can get it from the 'Downloads' page. 2. Extract 3D Analyze to a folder, and run 3D Analyze.exe. 3. 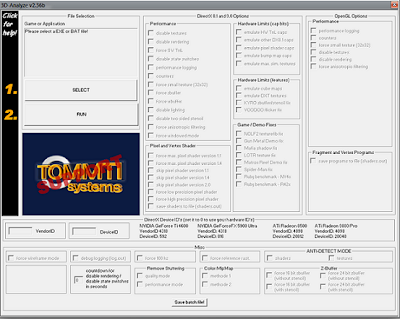 Once it has opened click on 'SELECT', and browse for the .exe file for the game you want to run. you might need to experiment around. 5. Try running the game by clicking on 'RUN'. If it doesn't work, then there are a million things to try. I'll only list a few. TnL' roughly equates to 'emulate HW TnL'. and 'DeviceID' section. Only 4 types/models can be emulated though, so experiment around with the 4 values given. 9. If it still doesn't work, then check and search the forums. Someone might have discovered the settings you need. 10. If, and only if there are no previously discovered settings, post a new message asking for help.